Information on this page is collected from different sources, some own stuff is added. However, there is no guarantee for correctness or information being up-to-date. This collection is meant as a very brief overview to give a feeling for the country. Denmark, spanning an area of 42,930 km² and giving home to approximately 5,5 Million People - being to 97% Danish - is part of the EU. While Danish is the official language, German and English are widely spoken - suiting the mass of tourists invading the country every year. Besides tourism, agricultural products, fish, beer, home electronics and furniture are the main income sources. Denmark is known for its clear industrial design.The country has a constitutional monarchy, religion is Lutheran. The countries only land connection is Germany in the South. Denmark is bordered on the west by the North Sea and on the east by the Baltic Sea. To the North, separating Denmark from Norway and Sweden, are the Skagerrak and Kattegat straits. 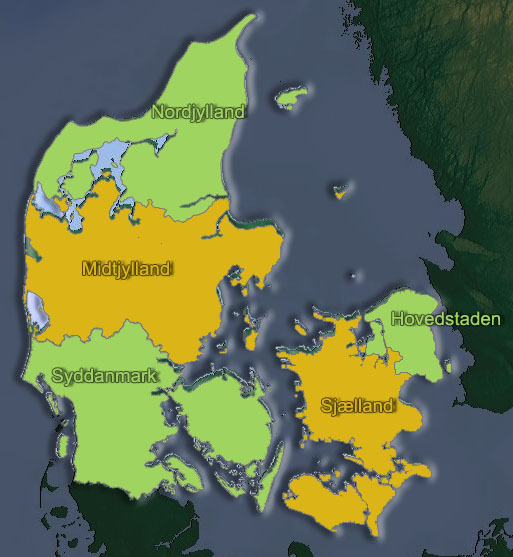 The small countries biggest area is the Jutland peninsula. Also 500 islands belong to the country, of which around 100 are inhabited. On the largest one - Zealand - Denmark's capital city Copenhagen is situated with around 1.5 Million living in, forming the largest city of Scandinavia. It is a flat land of woods, beaches and heather-moors, highest elevation is the Yding Skovhøj with just 173m. Midsummer eve is celebrated with bonfires end of June, comparable to other nordic countries do. Copenhagen Summer Festival (chamber and classical music concerts, last week of July& first two weeks of August). The Århus Festival is more broadbanded : Music and drama performances as well as the Viking Festival start here the first Saturday in September. The environmental perspective doesn't look optimal: deforestation, drying of sensitive wetlands, few streams being still unchanged and intact. Still there are about 400 birds found (majority magpies, geese,ducks) as well as roe deer, wild hare, foxes, squirrels, badgers and many red deer. Beech and oak trees, fewer hazel, maple, aspen, lime, chestnut and birch can be found, lots of heather on the moores. Denmark has a single National Park - Rebild Bakker, formed by the 77 km² public woodland Rold Skov. Although having a fairly mild climate (related to the warm Gulf Stream along the West coast) you must always have a rain suit accessible - it's up North! During May to August 25°C can be reached, and you can enjoy up to 18 hours daylight! In winter it doesn't get really cold, snow is by far less than I am used to in Germany or Sweden, temperatures just around zero usually. I have seen some winters with snow and temperatures well below zero as well, but the sea climate still is quite moderate. The best time for vacation is starting late April, when both weather improves and tourist attractions get alive. I can also recommend a stay in one the thousands of summer houses during	winter, best over new years eve. It's fantastic, when the winter winds blow, it's cold outside and the open fire, to be found in many of those house besides electrical heating, is warming the body directly into the heart. Those summer houses are also my personal choice during summer month, high season is here July to August, when the invasion starts. Despite mass tourism it still feels ways apart from lying one by one at the beach, it keeps a certain level of individualism. Danmark is rather expensive, driven by the high taxes. Camping is a fairly cheap alternative, and the possibilities are large and more than acceptable. Taking the strong Northsea winds into consideration a tent can be tricky. Service charges are included in taxis and restaurants, bills are not mandatory, rounding up the sum is OK though. What can you do in this country? Besides relaxing - just lying at the kilometer long sand beaches - you can swim in the sea (partly dangerous due to sub-surface water currents), learn or practice windsurfing, yachting or fishing - a lot around water as you see. If the wind is not too strong against you, cycling can be fun due to the flat country, also many established cycling tracks help making Denmark a bicycle-friendly country. The most famous food of Denmark is the smørrebrød (literally 'buttered bread'), which ranges from rather simple versions to real creations consisting of different types of bread, topped with everything the heart wants. The name Smørrebrød became widely known from the Muppet Show (you remember that cook?). Besides that fish is a good choice due to the vicinity to the sea, gravad laks (Graved salmon), variations of potatoes and a huge choice of pastry (wienerbrød) are just some highlights to mention. From the liquid side Tuborg and Carlsberg breweries offer fine beers. The most easy to find, typical Danish meal is the Pølser, a Hot dog sausage with bright red skin found everywhere in snackbars. Ordered as Hot Dog, Hot dog bread and sausage are extended with mustard, ketchup and a sandwich sauce, topped with roasted onions and sweet cucumber. Sounds awful? Tastes delicious ! If you would like to avoid red sausages just try the fried version, calles "Ristet Hot Dog", even more tasty. Copenhagen: A really cosmopolitan city with many entertainment and sightseeing attractions. Denmark's capital is also Scandinavias largest city with 1.5 million inhabitants. It's most famous icon, the Mermaid statue, is located on the waterfront 10 minutes north of the city centre. The amusement park Tivoli, the world's longest pedestrian mall Strøget and Amalienborg Palace - home of the royal family since 1794 - are just some of the things you need to visit. Århus: In this cultural center of Jutland I personally recommend "Den Gamle By" (The Old Town), an open air museum with 75 restored buildings transported here from all over Denmark and built up again forming a provincial town. A watermill, a windmill and many 17th/18th century half-timbered house can keep your interest for many hours. Legoland: The dream of many (big) children can be found in Billund: Taking over 40 million original Lego plastic blocks, some years of work and 10 hectare space to build a theme park, that gets the second-most visited attraction in Denmark beside Copenhagen. New exhibits are built continously, so a second visit is always worth the while. 1523 Union dissolves when Sweden elected Gustav Vasa as its King. Norway remains under Danish rule for three more centuries. ~1800 Britain attacks Copenhagen twice during Napoleonic wars and damages the city heavily, leaving Sweden an easier game to demand Norway from Denmark. 1830s Cultural revolution in arts, philoslophy and literature.